By Chris Williams: Saturday night to defeat IBF/WBA light welterweight champion Julius Indongo (22-1, 11 KOs) to become the IBF, WBA, WBC and WBO 140 lb. champion, but unfortunately the IBF has now ordered him to face his IBF mandatory challenger Sergey Lipinets. 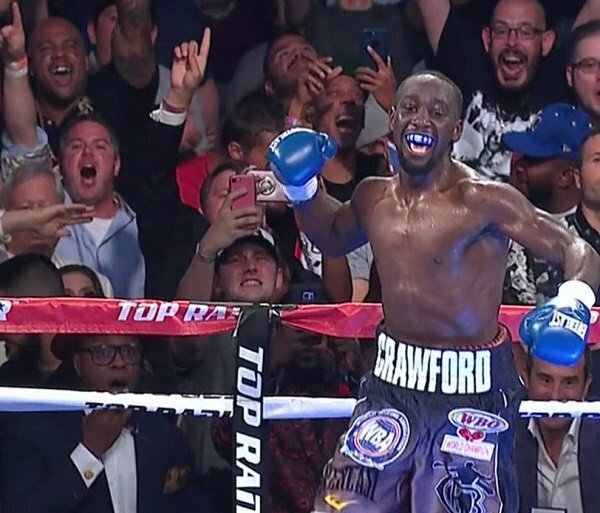 The decision by the International Boxing Federation to push the 29-year-old Crawford to quickly defend his IBF title against #1 IBF Lipinets puts him in a position where he’s going to need to start vacating his titles right away. Of course, Crawford can go ahead and defend his IBF belt against Lipinets but it’s not a big money and it likely won’t bring him much fame on ESPN. The IBF has sent letters to Lipinets and Crawford management to start the negotiations for a fight, according to Dan Rafael. There will be a purse bid on September 17th if the two fighters’ management are unable to make a deal. However, Lipinets’ promoters reportedly want an immediate purse bid. The purse bid is scheduled for August 31. This was a smart move by Lipinets’ management, as it’ll likely result in Crawford giving up his IBF belt fast. Crawford’s promoter Todd duBoef of Top Rank says he’ll talk with him to see what he wants to do. If Crawford does fight Lipinets, then it likely will eat up the remainder of 2017 for the unified champion. He’ll soon be 30-years-old and he’s not anywhere close to becoming a PPV star. Crawford’s only time as a headliner on PPV was against Viktor Postol, and that fight brought in just 50,000 buys. Crawford is so far behind where Pacquiao was when he was the same age in terms of popularity. It’s easy to understand why. Pacquiao’s fighting style was an instant hit with the U.S boxing fans due to his blazing hand speed and his aggressive fighting style. In contrast, Crawford is a counter puncher, who mainly sits and waits to throw counter shots. He doesn’t attack his opponents like Pacquiao. Lipinets, 28, recently beat Lenny Zappavigna by an 8th round TKO last December in an IBF 147 pound title eliminator. Things would have been easier for Lipinets if Indongo were still the IBF champ. Indongo would want to defend against Lipinets. But in the case of Crawford, he’s got other options available to him in a potential fight against the winner of the Pacquiao-Horn fight. Crawford’s promoter Bob Arum of Top Rank wants him to sit at ringside for the November rematch between Manny Pacquiao and WBO welterweight champion Jeff Horn to create interest from the boxing fans in him facing the winner. The thing is, Crawford might not get the winner. Pacquiao will likely retire whether he beats Horn or not. As for Horn, he can make good money fighting anyone. He doesn’t need Crawford to rake in the huge cash in Australia. Horn would be doing the 85-year-old Arum a big favor in fighting the counter punching Crawford on ESPN. Horn might as well fight someone else. I don’t think he’ll do that though. Horn will be a good trooper and agree to give Crawford a title shot if he still has the WBO title in his possession after he faces Pacquiao. The worst case scenario for Arum is for Pacquiao to beat Horn and then decide on retiring rather than taking one for the team by agreeing to fight Crawford. Arum obviously would be happy if Pacquiao agreed to fight Crawford, because it would give Top Rank promoter a chance for the Nebraska native to become a star if he beats the soon to be 39-year-old Pacquiao badly. Pacquiao would be a stepping stone for Crawford. I don’t know how Pacquiao feels about being used as stepping stone though, especially given all he’s done for Top Rank. He’s made them a lot of money. Crawford likely won’t come close to being the money maker that Pacquiao was for Top Rank.